Ensure the water in your pond moves freely and easily using the Cal Pump T4000 Torpedo Pump and Prefilter. This convenient package provides both a lasting pump for moving water, as well as a heavy duty prefilter to protect the pump from debris. The included Cal Pump Direct Drive Torpedo Pump, 4000 gph is ideal for powering large waterfalls and circulating water in medium or large ponds. Its innovative design withstands constant use, and allows the unit to be used either horizontally or vertically, as well as submerged or inline. 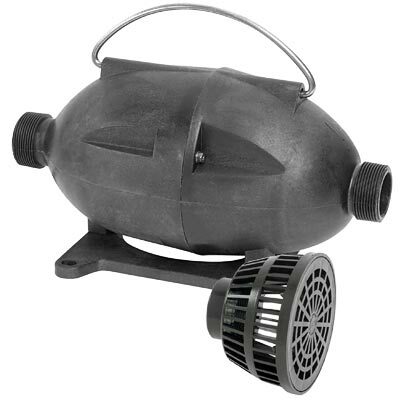 The pump uses no oil, eradicating the danger of it leaking into the pond and harming your fish or aquatic plants. Made with lasting, non-corrosive components, this torpedo pump ensures efficient and continuous operation for your water feature. The ingenious design of the pump offers amazing versatility, allowing you to place the unit horizontally on its base, or vertically with the included Cal Pump Plastic Prefilter Screen. This prefilter lifts the inlet off of the base of your pond when used fully submerged, helping keep debris out of the pump. Use the attached, metal loop top handle to easily maneuver the pump for the right placement in your pond. Its 0.33 Hp, direct drive motor can move up to 4000 gph at 1 foot of head height, and its outlet readily accepts female 1 1/2" NPT threaded fittings. Keep your pond aerated and the water moving well with this T4000 Torpedo Pump and Prefilter.